Enjoy the Music.com is high-end audio's leading online review site and the industry's official CES 2017 Press Center. We have reviews of home / portable audio including turntables, Hi-Res Audio, amplifiers, speakers, etc within our Review Magazine. Our videos from the Consumer Electronics Show (CES) 2017 in Las Vegas features high fidelity, high-end audio products desired by music lovers and audiophiles. For over 20 years we have provided our audience with valuable information about headphones, amplifiers, turntables, DACs, loudspeakers, and more. If you missed our live broadcast, we have highlights from our CES 2017 live stream below. 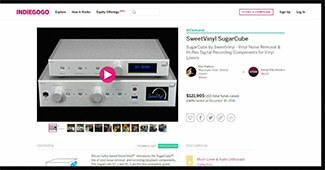 This video is hosted by Steven R. Rochlin, a longstanding independent authority and innovator within the consumer electronics industry, and features SweetVinyl's Dan Eakins And Leo Hoarty. As always, in the end what really matters is that you... enjoy the music! ---> Back to Enjoy the Music.com's CES 2017 live video streams. 2017, 2016, 2015, 2014, 2013, 2012, 2011, 2010, 2009, 2008, 2007, 2006, 2005, 2004, 2003, 2002, 2001, 2000, 1999, 1998, 1997, and 1996.